Bircher Müesli (or birchermüsli) is a Swiss breakfast meal that was invented by Maximilian Bircher-Benner in the late 19th century for patients in his sanatorium (http://en.wikipedia.org/wiki/Muesli). It is composed of rolled oats soaked in water, then mixed with yoghurt and lemon juice, as well as nuts and fruits. It is usually served for breakfast but can also be eaten any time of the day. It is different from granola and oatmeal, in that the oats are raw, and not grilled nor cooked. The original recipe recommends cream or condensed milk, which I replace with yoghurt to make it a bit lighter. Also, instead of hazelnuts or almonds, I sometimes add pecan nuts which I like very much. I usually prepare a big bowl of müesli for the whole week, it keeps very well in the fridge for a couple of days. Soak the oats in the water for a few hours or overnight. Remove the water (use a sieve/strainer) and put in a bowl. Add the yoghurt and mix. 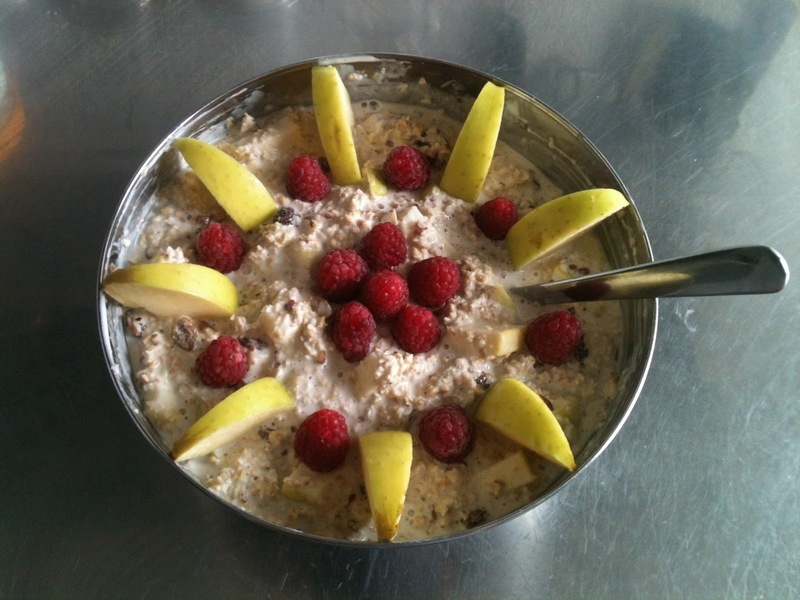 You can add more or less depending on how "solid" you want your bircher to be. Add the lemon juice bit by bit until you start to taste it (it should make tiny bubbles). If you want to sweeten your bircher, I recommend you add some liquid honey here (or sugar). Note: you can add more or less of the fruits and nuts to your preference!